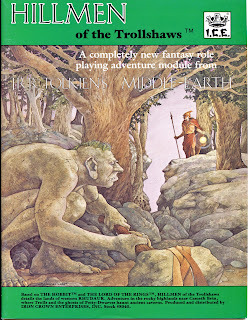 For whatever reason, ICE decided to cover Rhudaur in an adventure module instead of a full-blown campaign -- probably because it never asserted itself with any glimmer of promise. Its "height of power" came right after Arnor's split and was over in an instant, declining from the tenth century on. Still, I always thought it deserved better, though can't complain. Hillmen of the Trollshaws does complete justice to the north-central region of Rhudaur and its reputation as the "evil wood", swarming with primitives who despise Dunedain and Angarim equally, not to mention trolls. There's a feeling of spiritual malaise about the area that still creeps me out, and sets a perfect tone for a campaign. The beauty to Trollshaws is its flexibility. 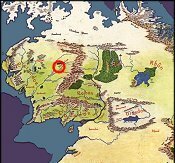 It's suitable for almost anytime before the fall of Arthedain and dissolution of Angmar, whether during Rhudaur's inclusion in Arnor (1-861), its independence as a sister kingdom to Arthedain and Cardolan (861-1349), its subservience as a puppet state of Angmar (1349-1410), or its complete dominance under Angmar (1410-1975). Rhudaur changed a great deal throughout these periods, and the module is designed to show its growth and decline, particularly at the capital of Cameth Brin. The primitive culture of the Hillmen contrasts sharply with their Dunedain overlords, notable for its inflexible rejection of both the Valar and Black Religion of Sauron in favor of ancestor worship, with a particular reverence for ghosts. Of which there are plenty to be found; the Ta-Fa-Lisch (dwarven ghosts) haunt Cameth Brin in the early days before the Dunedain take control. Between the tumultuous politics, an inhospitable land, and the overabundance of Hillmen and mercenaries, it's no wonder the Dunedain of Rhudaur fell so swiftly under the shadow, and the adventure-sized module conveys this with terrific economy. 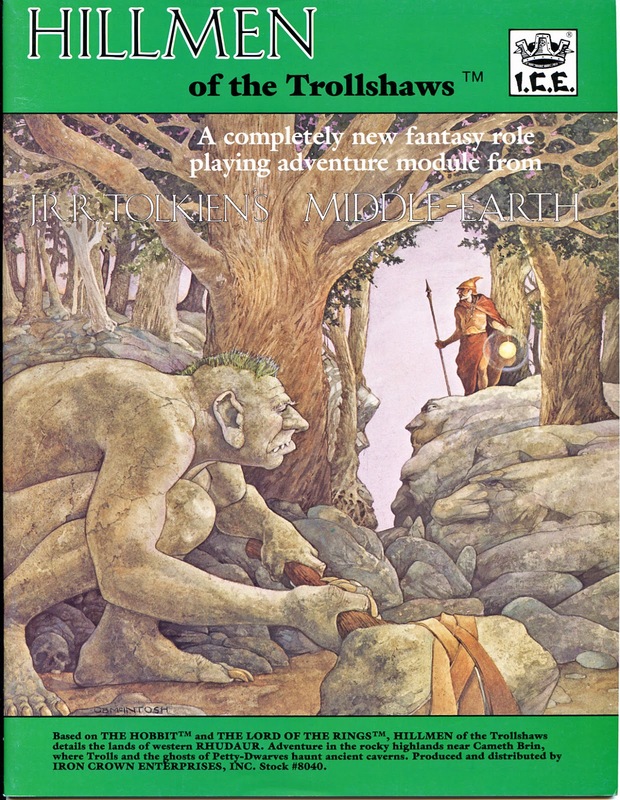 The layout of Cameth Brin ("The Twisted Hill") dominates the product, and even its early structure is provided for those who wish to get involved with ghosts working in cahoots with Hillmen. After the Dunedain expansion of 166-339, it becomes Rhudaur's capital, though no less ominous, and the look is naturally sinister: "Its base is a steep hill, but from this foundation erupts a tortured outcropping of naked black granite that leans impossibly far over the southern face, as if a sparrow's sneeze would send the craggy top tumbling down". The inside of it lives up to its appearance, with halls of enchanted darkness, surprising traps, and a generally schizophrenic feel that betrays haunted roots underneath an advanced Dunedain architecture, which in turn becomes usurped by Hillmen much later after the Great Plague. The barracks settlement of Tanoth Brin below the hill is also detailed, as well as the nearby town of Talugdaeri. Then there's an exemplary troll lair for those desiring adventure outside of Cameth Brin. Add to all of this the color map of central Rhudaur, and the end result is pretty much what's needed for a solid Rhudaur campaign any time pre-1975. Next up: Empire of the Witch-King.